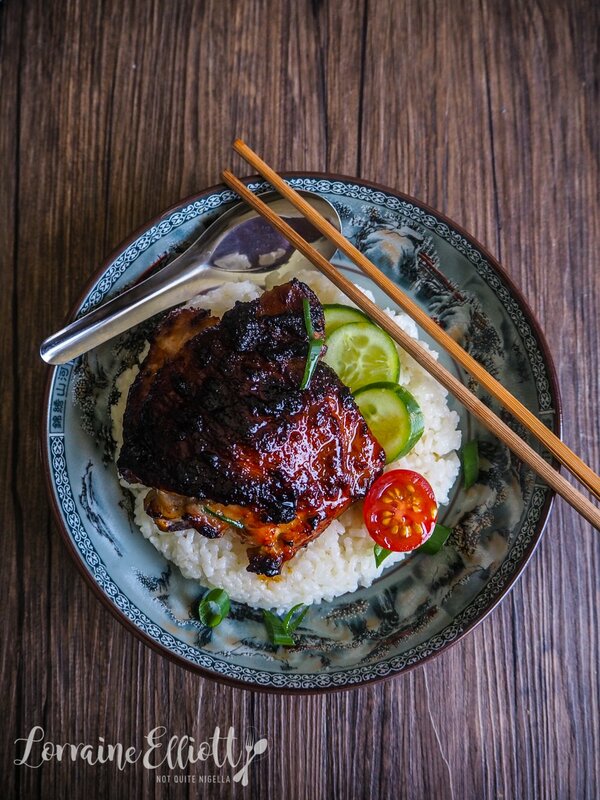 This miso glazed chicken recipe has to be eaten to be believed. It's ridiculous in its simplicity. 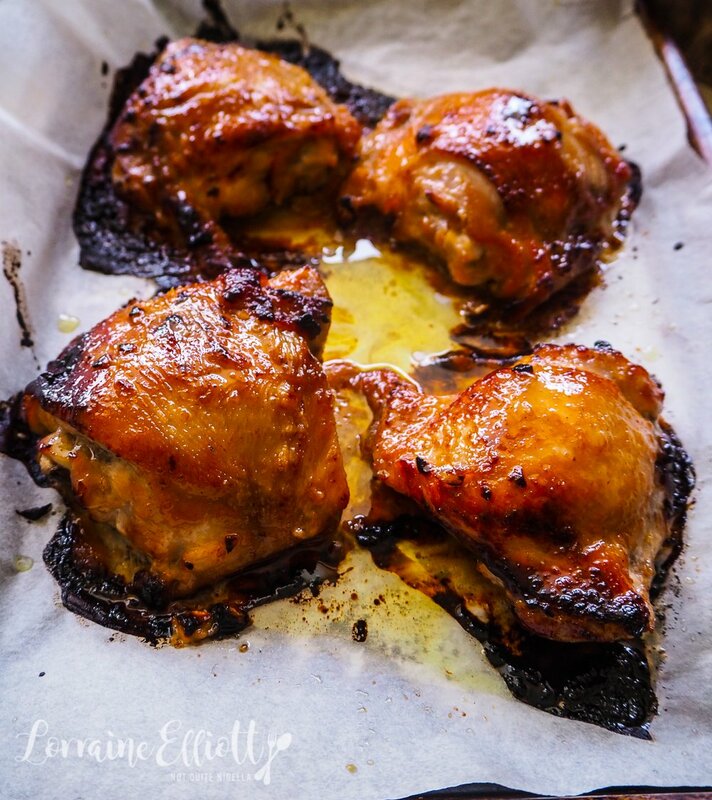 Just marinate chicken with a few ingredients and bake for 30 minutes. But what results is the most delicious chicken tray bake you could dream up. 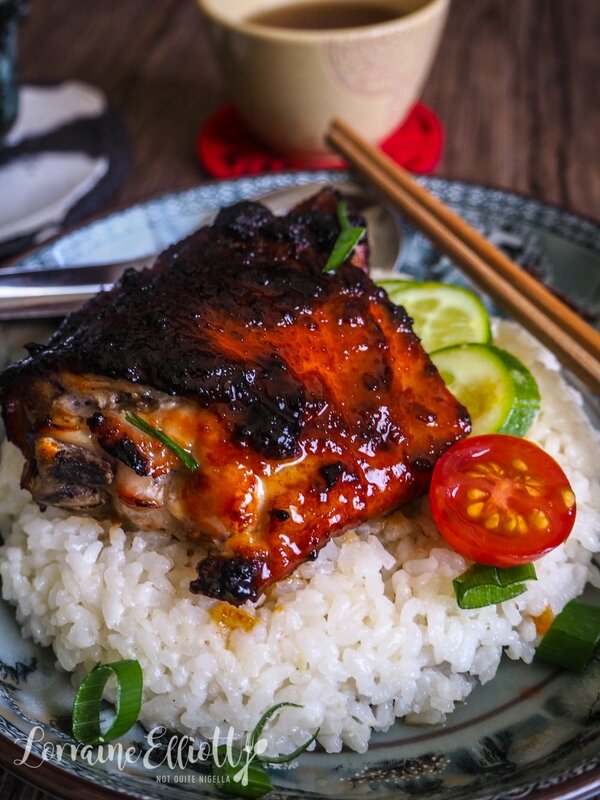 Sweet white miso, ginger, garlic, soy and mirin create a delectable glaze for chicken. And yes this is a pushy recipe Dear Reader! I love Japanese flavours and white miso really lends itself to many types of protein and vegetables. I actually usually make this with pork (the original recipe comes from my book published a few years ago). But when I had some chicken thighs I thought I'd give my hand at a chicken version. I also had a tub of white miso that I needed to use up (I have expiration date anxiety) as it sat neglected in the fridge. I paired it with koshihikari or sushi rice flavoured with garlic, ginger and sesame oil and it was one of the most delicious things I could have ever eaten. When I put it up on my Instagram I got so many messages asking me for this as a matter of urgency that I rushed it up. Speaking of rushing, the Elliott household is in the midst of Marie Kondo madness. Have you been caught up in the Marie Kondo cult of cleaning up? I am very susceptible to this. I love a tidy house. The hours after when my cleaning lady leaves is the best two hours of my fortnight. That is, until Mr NQN comes home, strips off his socks, leaves his cycling gear on the floor and then his bowls and cups on the lounge or table. Essentially the biggest piece of tidying advice the organising guru gives is to keep things that "spark joy" in your life. That give you a little flutter in your heart or rise. This was easy for me. I gave away a hand towel that used to annoy me. It was a designer one but inexplicably one day it developed a huge streak on it that discoloured it. Every time I used it I wished that streak wasn't there. So I said "Thank you" to it and then packed it away for someone else to love. It got rather addictive that I rearranged my drawers folding everything the Kondo way. I would actually smile when I opened my drawers and saw everything nicely arranged. I worked in between Kon'Maring (the verb of tidying her way). And then I had to stop because I hit a wall. A wall of Mr NQN's stuff. While I love giving things away, he loves hoarding things. It's a family trait and he comes from a long line of hoarders. It is the most frustrating thing. And according to Kon'Mari, you are only responsible for tidying up your own possessions. "I'm just warning you, I'm Kon'maring" I said to him when he walked in that evening. "Huh?" he asked. I explained the principle was to only keep things that "spark joy". "I'd better be careful then?" he asked grinning, knowing that his messiness is the number 1 source of tension between us. "Well you know what they say, you just have to thank it and give it away!" And with that whenever we'd disagree, I'd say to Mr NQN, "You're not sparking joy!". So Kon'Maring should come with a warning. You may end up living in separate houses! So tell me Dear Reader, do you have expiration date anxiety? And are you Kon'Maring? Are you a tidy or messy person? Step 1 - Mix the mirin, miso paste, ginger, sugar, garlic and soy sauce together. 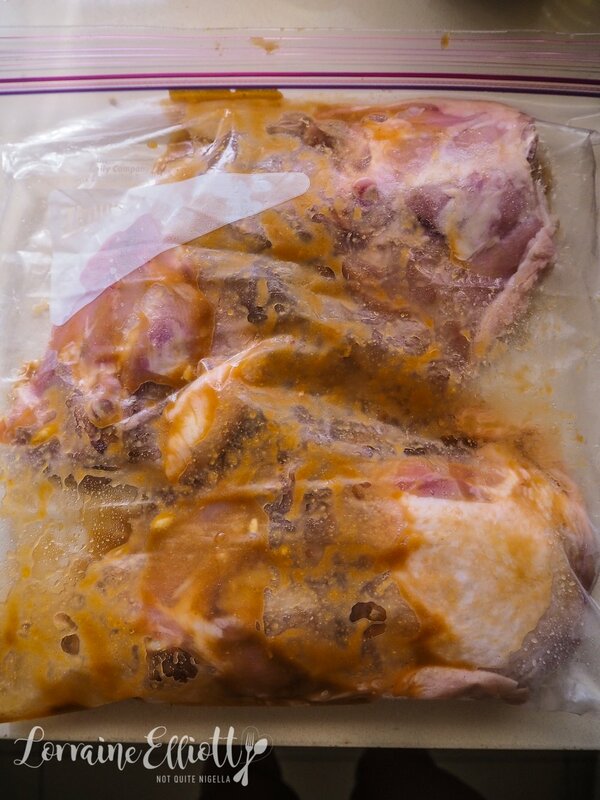 Coat the chicken with this paste and marinate for at least 2 hours or you can also marinate this overnight. 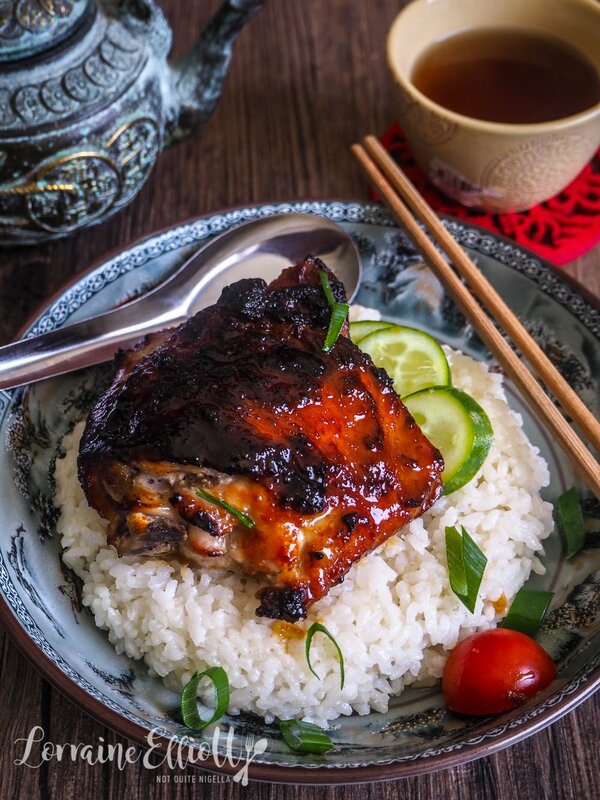 Bring the chicken to room temperature (this is important not just because the sweet glaze on top caramelises quickly and you want the chicken cooked through). Step 2 - Preheat oven to 190C/380F and line a baking tray with parchment. Place the chicken pieces on the tray and allow the excess paste to drip off (I didn't as you can see and it formed a burnt ring around it). Roast the chicken for 20 minutes. 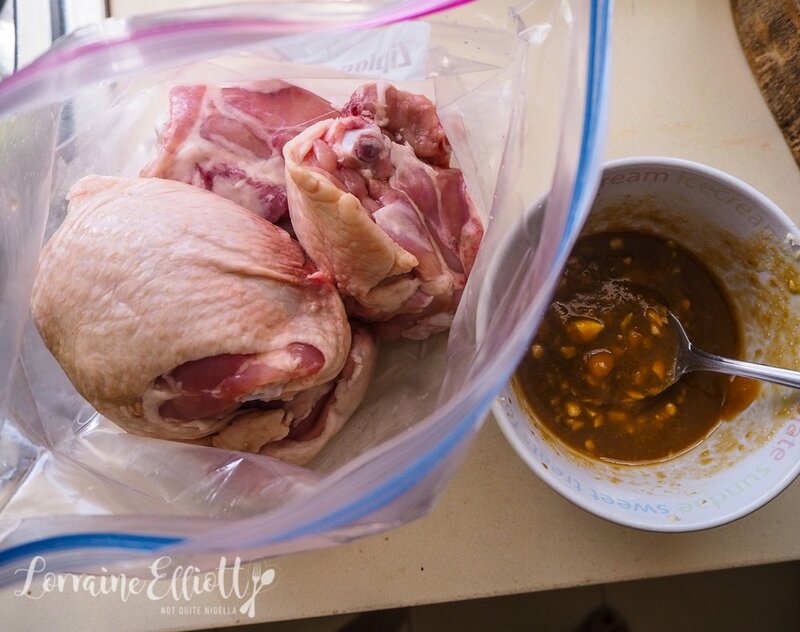 Baste with the oil from the chicken and then roast for 10 minutes or until cooked through. Step 3 - Meanwhile while the chicken is cooking, make the rice. Rinse the rice several times until the water runs clear. 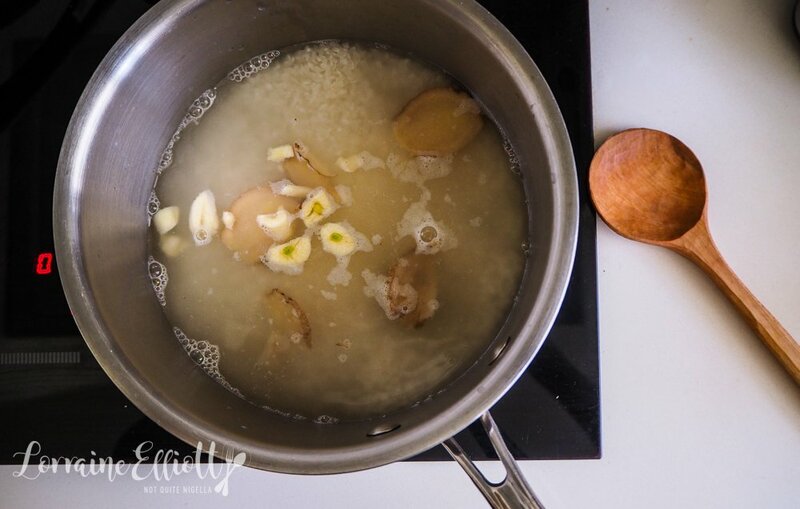 Then add the stock, ginger and garlic and bring to a boil. Reduce heat to low and keep the lid on and steam for 15 minutes. Add the sesame oil and stir. Serve the chicken with the rice.